How Can I Pay for Christmas When I Don’t Have Money? We all know that Christmas is a shopping season but it also seems like the time of year that cash is typically hard to come by. A holiday loan type personal loan can help bridge the gap between your gift list and your bank balance. It can take the pressure off paying for holiday travel, gifts, and even a party for family and friends. Set a budget for holiday spending. It’s easy to go overboard during the holidays. Retailers use this time of year to bombard consumers with special offers and savings tied to credit cards during the frenzy of holiday shopping. They make it even easier to spend more than you can afford. While a holiday loan can help you complete your holiday shopping, it also means you could be taking on more debt, so recommend planning your holiday finance strategy before shopping can help you stay on track. Then you will be able to make any loan repayments on schedule. Just Say No. Say no to impulsive purchases and on-the-spot offers of extended credit by establishing your spending plan before shopping. Stay within the limits of available cash, your Christmas shopping list, and your holiday line of credit or loan. Don’t fall victim to opening an additional credit card account! Enjoy the holidays and don’t stress yourself out worrying about buying everything on everyone’s holiday list. 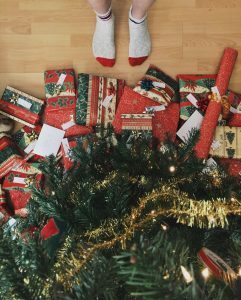 Creating smart financial boundaries ahead of time will help you to fully enjoy the holidays without the stress and burden of over-spending on things that you truly don’t need. If you do need extra cash, use your holiday loan wisely to avoid post-holiday debt regrets. Start by filling out the form to the right!